View of the Alhambra from the Mirador de San Nicolás in the Albayzin of Granada. The Alhambra, a UNESCO World Heritage site is a palace and fortress complex located in the classical Andalucían city of Granada, Spain. It was originally constructed as a fortress in the year 889 and later converted into a royal palace in 1333 by Yusuf I, Sultan of Granada. 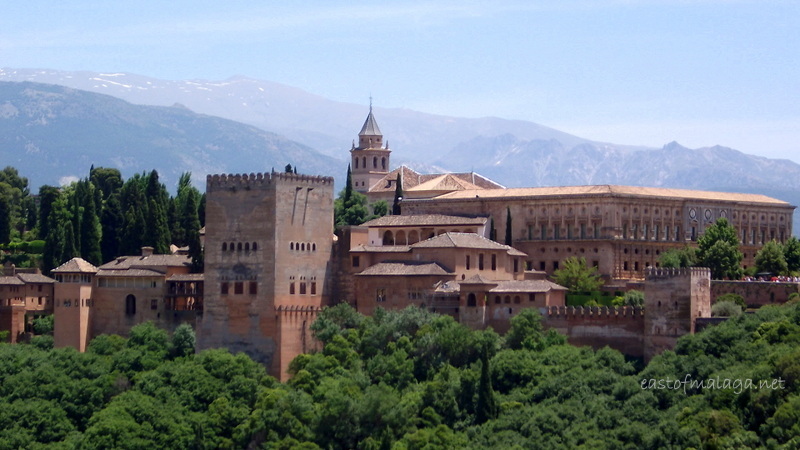 La Alhambra’s Islamic palaces were built for the last Muslim emirs in Spain and its court of the Nasrid dynasty. After the Reconquest by the Catholic Monarchs in 1492, some portions were used by Christian rulers. The Palace of Charles V, built by Charles V, Holy Roman Emperor in 1527, was inserted in the Alhambra within the Nasrid fortifications. After being allowed to fall into disrepair for centuries, the Alhambra* was rediscovered in the 19th century by European scholars and travellers, when restorations commenced. It is now one of Spain’s major tourist attractions, exhibiting the country’s most significant and well known Arab-Islamic architecture. 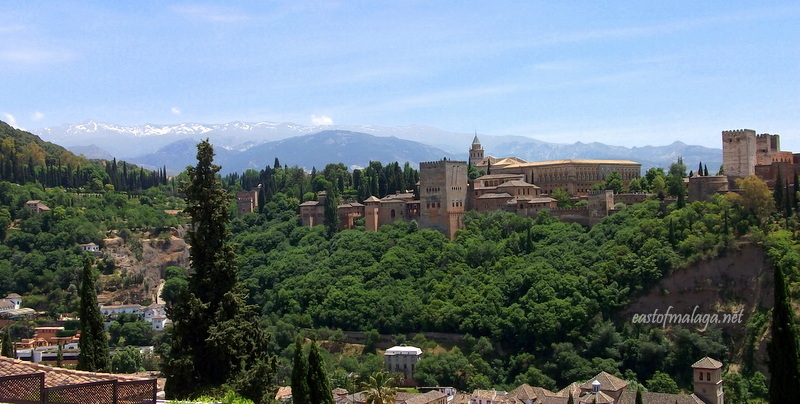 The Palace of Charles V – within the Alhambra, as viewed from the Mirador de San Nicolás in the Albayzin of Granada. My final three shots were taken on Monday afternoon as we were having lunch in one of the wisteria-covered restaurants in Paseo de los Tristes. Perched above the Rio Darro at the end of Carrera del Darro, this plaza was once one of the busiest gathering spots in Granada, positioned along a curve of the river between the Alhambra and the Albayzin. These days, Paseo de los Tristes is a popular place to eat, with restaurants lining the north side of the square and magnificent views of the Alhambra soaring above. 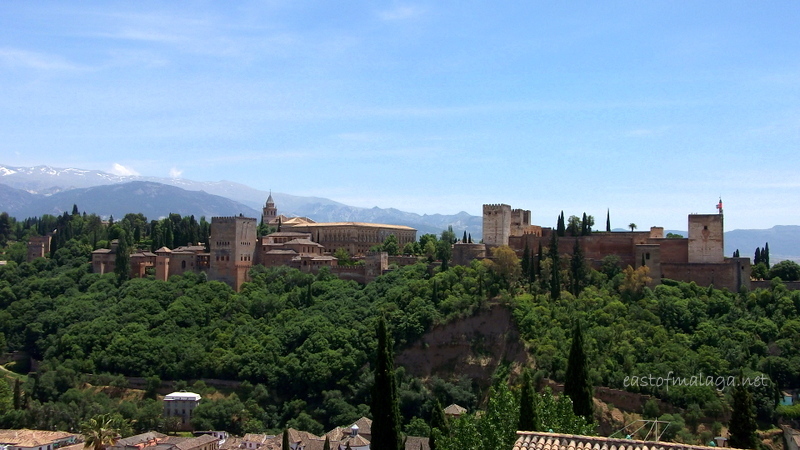 View of the Alhambra from the Paseo de Los Tristes, Granada. View of the Alhambra through the Wisteria, from the Paseo de Los Tristes, Granada. 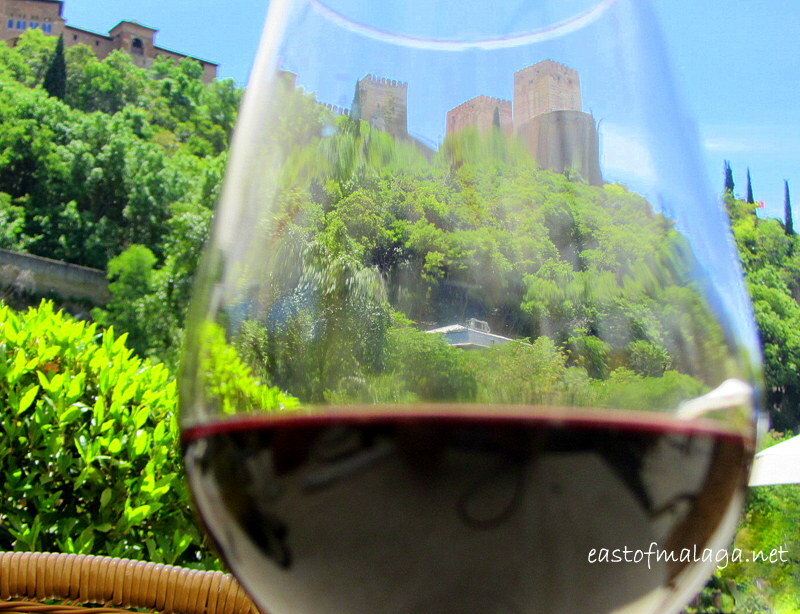 View of La Alhambra viewed through my particularly delicious glass of Rioja, as I was having lunch – CHEERS! This entry was tagged Alhambra, Andalucía, Europe, Granada, history, photography, Spain, Sunday Post, travel. Bookmark the permalink. Pingback: Venturing further afield: A long weekend in Zaragoza | East of Málaga .... and more! Pingback: CBBH Photo Challenge: Ancient and Modern | East of Málaga .... and more! Beautiful and nothing like it’s namesake the Alhambra Theatre in Bradford! Hahahaha I know exactly where you mean. When I lived in Lytham St Annes, we used to drive to Bradford for a curry!! 180 mile round-trip! This is still on my list of places to visit – great photos! The Alhambra is a fantastic place to visit, just make sure you have reserved your tickets online beforehand! God my fingers get a good workout scrolling through your comments Marianne! Fabulous pictures so unsurprising that so many people feel compelled to comment! We used to live in the Albayzín across from the Alhambra, I had a complete view of the Alhambra from my roof-top terrace…………. but I like living in Malaga soooooooooooooo much better! Original view through your wine glass. I was very privileged to be sitting underneath it, enjoying a delicious lunch … and yes, the wine, too! Great shots as always 🙂 I love the one through the wine glass – how clever. I went to the Alambra way back in the 90’s and would love to go again one day. Thanks Diana, it’s very kind of you to say so. 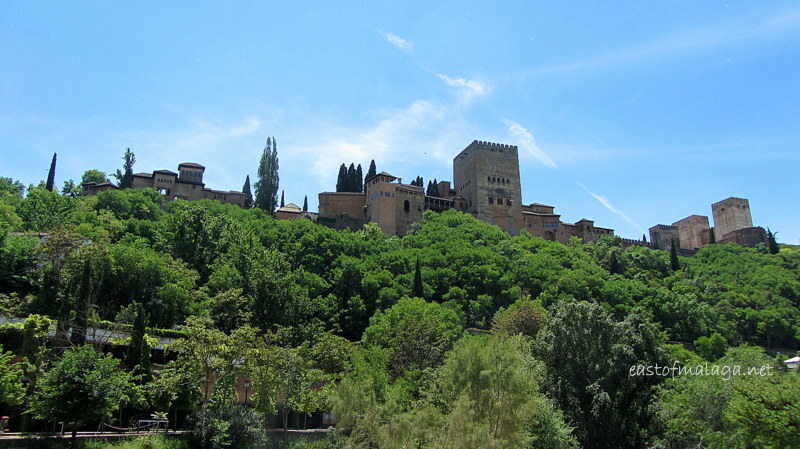 I hope you get to see the Alhambra – just dont forget to view it from afar as well as the interior! Loved loved Alhambra! Plus I have wonderful memories of a jamon bocadillo enjoyed sitting on the pavement waiting to get in! Glad you enjoyed it – but seriously, how could you not!? Granada is a great city, isn’t it? 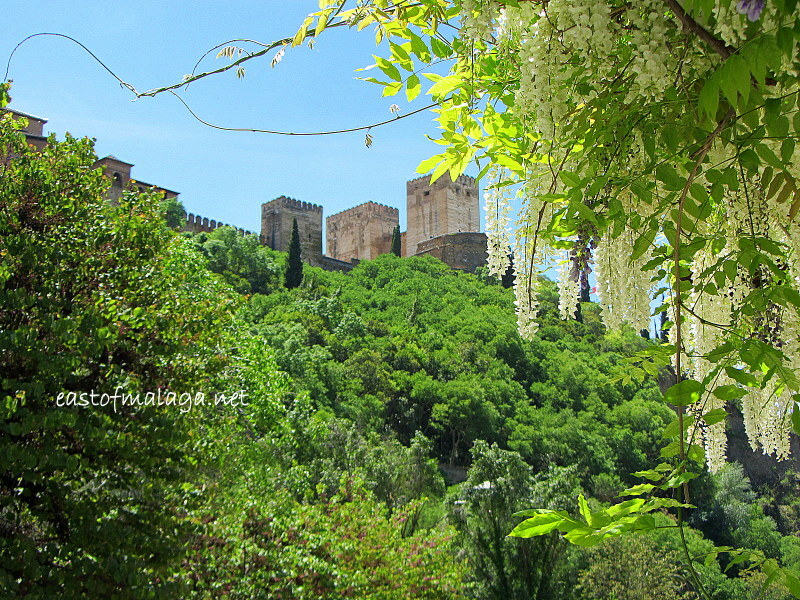 Ahhhh … Granada … the Alhambra … a mi me gusta! Truly among my favourite places on the planet. The city is beautiful with an electricity in the air but when you step inside the Alhambra magic begins. Must. go. back. soon. Thanks for those stunning shots … what a day you were having! And that last shot? Brilliant! Perhaps one day we will meet over a glass of rioja there too! Yes, it really is a beautiful city, full of history. SUN AND WINE..WHATS BETTER OTHER THAN GREAT COMPANY.. oops, disregard the caps ! Yes thats up there as well. Are you an excellent chef too? I bet you are! I`ve had loud complaints on my blog about the price of saffron in this neck of the woods. Any idea how much it is in Spain? Before we all start our own crocus farms here! Saffron is the most expensive spice in the world, taking an area about two football pitches of crocuses to glean a kilo, with each stigma collected by hand. So I guess it’s no wonder it’s so costly! I live Granada! It is one of my favorite cities in Southern Spain. Love the diverse culture and feel of the city. Yes indeed! Where do you live? As and from this very post, Granada is on my bucket list of places to see. You wont regret it, I’m sure! I`ll look forward to that! I hope you get to see La Alhambra very soon, too! That last shot, through your wine glass? That’s the one that makes me want to skip work and head straight to the airport with nothing more than my passport and credit card. You are a fortunate woman, Marianne! Well, if you decide to do it, Sally, let me know and I would love to take you to recreate that very shot! Great post, just been there again and the blossom, trees and flowers were amazing all over Andalusia! You’re right – the flowers, trees and blossom is wonderful here at the moment. Thanks – it is a very special city, isn’t it? …and the view was free, of course (unlike the lunch)! Thanks for your very kind comments – much appreciated. The old castles and fortresses often seem to grow out of the vegetation – so beautiful. My favourite photo is the 2nd to last. It has everything – flowers, greenery, an ancient structure… I can almost feel the delight of it all. Looks fantastic, we intend to go there when we are over in June. Thanks for sharing these excellent photographs. If you want to tour the Alhambra during your visit (which takes a good 4 hours), I would recommend an early entry (8.30am) rather than a 2.30pm much hotter (because it’s later in the day) June visit. You also need to be sure to buy your tickets in advance – don’t just turn up on the day as you will probably be disappointed. I can’t believe I haven’t been there yet… it’s so on my list!!! I can’t believe you haven’t either – it’s a “must visit” city! a fantastic view for eating lunch … i an sure your food and wine was up to the grandeur of the palace! Excellent photos, Marianne – reckon I could be tempted !! OH I would absolutely recommend a visit to Granada, Alec. I’m sure you would love it! We live about a 75 minute drive from the city of Granada and each time we visit, we usually try to have a wander around somewhere new, instead of treading the same-old tourist trail. We have visited the Alhambra Palace itself on at least a couple of occasions, but it was only last year that we viewed it from the Mirador San Nicolas. Our visit on Monday (for my hubby’s birthday) brought us the added delights of Sacramonte (the gypsy quarter) as well as a wander along the Carrera del Darro – which was how we discovered the Paseo de los Tristes. Nice shots Marianne.. I must go again and take some photos. Now, this I’ve seen. Such a wondrous place, Marianne, and your photos captured its setting perfectly.